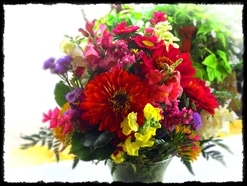 Arrangements can be made for any event year round, and in the summer/fall you can have Simmons Farm field grown cut flowers. call 724-941-1490 and ask for Megan. 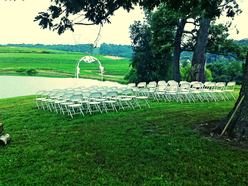 You can also have your wedding reception or wedding at Simmons Farm. We offer an affordable option for summer and fall wedding receptions. Email us at market@simmonsfarm.com for details. 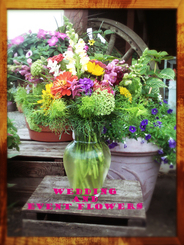 If you would like to make your own event arrangements you can hand select fresh flowers from our fields. There is a discount for larger buckets if you pick them, or we can pick them for a additional charge. will be looking their best for your event or wedding. Call (724) 941-1490 or email market@simmonsfarm.com and ask for Megan or Jan. Check out some examples below. You can have any container you like and work with the designer to make the arrangement that best fits your event.